As the editor-in-chief, I am excited to introduce Plant Direct (plantdirectjournal.org), a new journal from Wiley and the societies behind Plant Physiology, The Plant Journal, and The Plant Cell. Although there is a crowded landscape of journals to choose from, we believe that Plant Direct fills an unserved role for the plant community. We seek to be the sound science plant journal for the community of ASPB members, Society for Experimental Biology (SEB) members, and the authors who publish in our society journals. By “sound science,” we mean that instead of trying to determine the novelty or impact of a paper, we will judge manuscripts based on whether the experiments and analysis are performed to an acceptable technical standard and described in adequate detail in standard English, how well the conclusions are supported by the data, and whether the manuscript and contents meet all ethical and research integrity standards (as the person who will have to deal with it if it occurs, can we please not violate the last one, pretty please?). Plant Direct is a society journal, and we think the service-to-community part of our mission statement is incredibly important. Publishing has changed dramatically over the past two decades, and many of the services that journals have provided are no longer essential. The single most important service that journals provide now is managing the peer review process. But the effort of peer review at a sound science journal is done entirely by the community; active scientists are both the editors and reviewers (helped out by the great management staff at Wiley). When the community is doing the work, the community should reap the benefits. 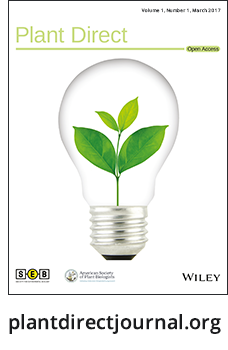 Our societies support our community, and the two sponsoring societies, ASPB and SEB, will be able to use the revenues from this journal to support their important work in education, outreach, networking, and the advancement of plant science. publication of anonymous reviewer reports upon acceptance. These features will speed scientific communication in two ways. The preprint is visible to the scientific community immediately, although readers must judge for themselves the work’s technical merit. This visibility has major benefits for authors, especially junior scientists applying for fellowships, grants, and jobs, by showing their great science to the world. It also benefits readers who are not in the author’s close-knit network and thus may not be able to put the author’s hard work to use to move their field forward until it is published as a peer-reviewed article. We think that preprints offer such a strong benefit to the community that we will give you a discount on your publication charges if your manuscript is posted on a preprint server at the time of submission to Plant Direct. The other features of Plant Direct speed the publication process by reducing or eliminating steps that contribute to delays. Allowing transfer of manuscripts from referring journals, or from the bioRxiv preprint server, will save authors the hassle of entering manuscript metadata multiple times. Referred reviews from participating journals allow the editor to benefit from previous reviews and may remove altogether the need to send the manuscript out for review, thereby reducing reviewer workload. The publication of reviewer comments will make the process more open and help to ensure the integrity and transparency of the review process. We are also going to be working with our author, reviewer, and editor community to identify and implement new ways to reduce the bottlenecks in the publication process. We will host a series of discussions in spring/summer 2017, both online (at Plantae.org) and at scientific meetings, to brainstorm new ideas and gauge the support for these ideas and ideas already in circulation. Please let us know your thoughts on these efforts as well as how we can make the publishing process better. We are also interested in ideas on how to incorporate mentorship and training of postdoctorals and graduate students into the publishing process. Let me conclude by asking you, the plant community, to join us as we launch this community journal. Please send us your manuscripts, review our manuscripts, and tell us how we can make the journal and the community better. We are excited to get this venture started and hope that you will be, too.